I’ve got two critters to share with you today via photos, though I saw plenty more (dolphins, seals, hawks, rats) while I was in San Francisco. At first I thought “Garter snake… San Francisco… This might be the endangered San Francisco garter snake (Thamnophis sirtalis), but upon Googling it, I see that the eponymous endemic is rather more colorful. It’s also limited in its range to the southern side of the Golden Gate, and Marin would be out of its range. So this isn’t some rare find, but just a beautiful little snake. Back to the geology tomorrow. What about that vein the centipede is crossing? Ok first the snake is a atratus commonly known as a Aquatic (Coast) Garter Snake Thamnophis atratus aquaticus CNAH no longer considers it a valid ssp the aqatic garter snake in the pic is a mut. Second theirs a garters in Marin that a person can confuse with a SFGS. 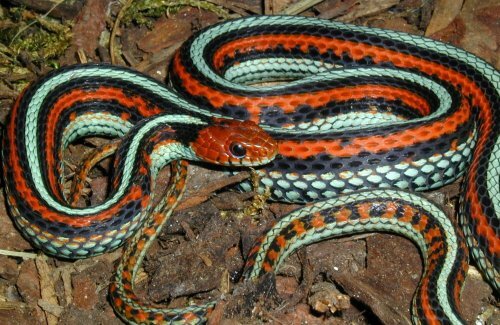 the Thamnophis sirtalis infernalis – California Red-sided Gartersnake striped phase.